It is Monday today which means New Week – New Opportunities – New Goals. I am only staying at home for three days this week and I am taking a long-weekend in my hometown. I am bringing all my blogging stuff, but of course I will focus on spending time with family etc. Another week with this goal, but I need to become more productive when it comes to blogging. What better way than to use a to do list? Same goal again, just because I am on vacation I still need to work on getting my fitness level up! I am a part of a blogging group that is studying this book, and I have not read anything yet because I was so busy last two-week. This week I have to start reading the book and implementing some of the things. I did actually did not manage to open an Etsy store, I am still working on the printables (I decided that I want to create editable areas and therefore need to do some more research). I ended up not doing anything for my Epla store either. Dog walks: well, I did manage 10km, and a little more – I ended on about 11.5 I think (forgot my phone once so I was unable to track a walk). I had to take a long walk on Sunday (in the woods – it was awesome!) to be able to complete this goal. It was a bit harder than I thought to complete it, I should really be doing two longer walks during the week, and one in the woods in the weekend and then do shorter walks, or play with the ball in the park the other days. When it comes to blogging this is kind of hard to determine, hence I will give it half a point. I did do a bit of these, but I also split my list in two parts (blogging and business) and I also continued on my master list, so this week I will move things from my master list to my weekly to do list (available here) – and this is what I will count. I have not started reading the book, so no luck on this one. So why did I have such a crappy week? Well I did not have my goals printed out and in front of me! Also I started getting a fever on (I think it was) Wednesday. I felt pretty crappy at work, and left a bit early, just spent the evening making dinner and then just nothing really. And that kind of just continued the rest of the week. But I have created a printable that will help me keep better on track. 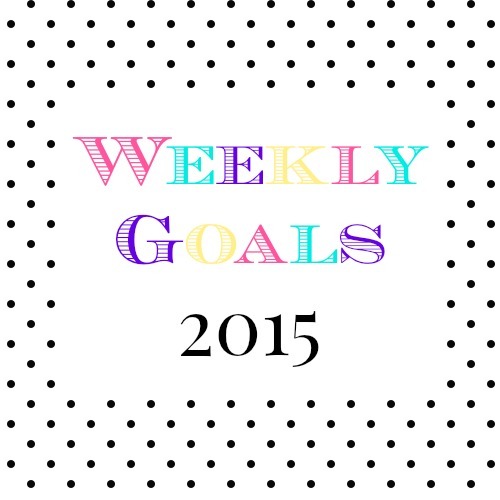 Sign up for my newsletter to recieve a free copy of my weekly goals printable!